Leaning Objective: Students are introduced to some more complex ideas in mathematics (fractals, infinite perimeter, fractional dimensions), students explore the relationship between maths and art, students conduct an open ended invesigation into patterns and sequences. 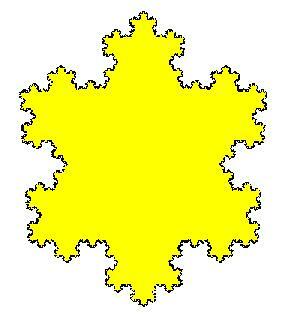 Discussion about what this shows (fractal shapes which repeat infinitely). Discuss the coastline paradox – what is the perimeter of the coastline of the UK? Does it have one? What happens when we try and be more accurate with our measurements? Students create their own Sierpinski Triangle, which can be generated quite easily (instructions here). Students need triangular paper which can also be printed from the link. Introduction to Spirolaterals – these patterns were first discovered by investigations into fractal designs. Use the computer generator here to show how these shapes are generated. (Teacher notes on this investigation here). Distribute the Spirolateral worksheet (download here). Students need squared paper and start to investigate different patterns and rules. Which initial starting rules lead to closed patterns? Which ones lead to infinitely repeating pattern? For an extension students could investigate turns of 45 degrees rather than 90 degrees. Lesson Plan on Modelling Asteroid Impacts – a modelling lesson which demonstrates the power of mathematics in making real world predictions.